Our AFS team is in need of more volunteers in Boone County to support and guide students and families through the international exchange experience. Not only will you enjoy seeing your home community through an exchange student's eyes, you will develop your own cross-cultural communication skills. 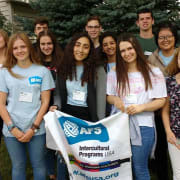 As a key part of the AFS support network, you’ll work directly with international high school students and their U.S. host families to foster a life-changing journey for both parties. Through regular meetings with you, an AFS student can get the most out of their experience in the U.S. You’ll join our local team of volunteers, who will train and support you as in your volunteer role.